Today I’m sharing with you my thoughts on the book Happily by Chauncey Rogers. The release date is today! Happy Book birthday! So if it interests you: GO!! and buy it of course! If it doesn’t, make it. Laure is a teenage street urchin just trying to get away. Where the rest of the world sees an enchanting love story, Laure sees royal incompetence and an opportunity to exploit it. She’ll have wealth and a way out of a life she detests, if she can only manage to pay off a would-be cloth merchant, outrun the angry bandits, hoodwink the royal family, and survive to tell the tale. Where to start? I don’t even know myself! I know however that I loved everything in this retelling. I haven’t read that much retellings before so I didn’t have that many expectations for the genre but I was honestly so amazed by “Happily”! I also read it very fast and I even had to force myself to stop reading sometimes. I could relate with Laure a lot as there are some resemblances with character traits. (Grumpy, irritated, change of attitude, sarcastic, sassy … ) Yeah, that’s definitely sounding like me! It was a funny and entertaining book and the writing is pretty great. I’m so happy with everything events. Especially the ending! Like I mentioned earlier, I haven’t read that many retellings before but this is probably one of my favourites! In the end, you are even a little bit jealous because you couldn’t be part of the adventure but reading it was worth every minute! There’s nothing that I hated but I wished that the book would have been a little bit longer because I didn’t want the story to be finished. Laure! And that for obvious reasons! But Luc was also a cutie-pie! I can’t leave you without sharing some things with you! These quotes come all from the book! I really enjoyed reading this “Cinderella” retelling! Thanks to the author for sending me a copy of “Happily”. I was also pretty surprised by the personalised letter that the author included as I didn’t expect it and it was honestly the nicest thing ever! So thank you, Mr Rogers, for that! 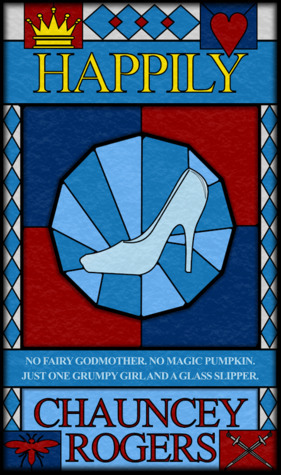 This may be a “Cinderella” retelling but it’s definitely nothing like it (does this even make sense?) so please give it a try! The book is funny (or at least I laughed a lot) and fast paced you don’t even see time fly past. I’d recommend it to every one that loves a good retelling! What are your thoughts on “Happily” by Chauncey Rogers if you read the book? And if not, do you plan to read it? Please let me know in the comments below! * A review copy was sent to me by the author in exchange for an honest review! I love retellings and this sounds so awesome! I can’t wait to read it! This is the second review of the book I am reading today and it does look awesome 🙂 I hope to read it soon. It is! 🙂 If you pick it up, I hope that you’ll end up enjoying it as much as I did! Yassss! Lovely review! I loved this one!